commands as needed, even after the meter is installed. Note: Applies to 3 element WYE and 2 element Delta connections. 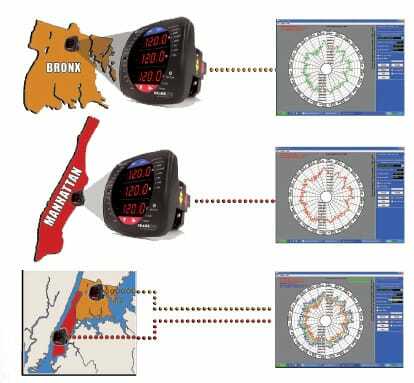 See full accuracy specications in Shark® 200 Meter User Manual. Neutral current 2% accuracy. 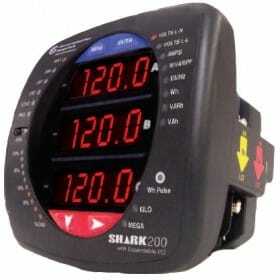 The Shark® 200 device is a traceable revenue meter. It contains a utility grade test pulse allowing power providers to verify and conrm that the meter is performing to its rated accuracy. This is an essential feature required of all billing grade meters. The Shark®200 meter offers the capability of having 2 Megabytes of data-logging to be used for historical trends, limit alarms, I/O changes and sequence of events. The unit has a real-time clock that allows for time stamping of all the data in the instrument when log events are created. The unit records up to 512 samples per cycle for a voltage sag or swell or a current fault event. The unit provides the pre- and postevent recording capability shown in the table below. Waveform records are programmable to the desired sampling rate. V5 provides up to 3 Megabytes storage and V6 provides a total of 4 Megabytes. The meter's advanced DSP design allows Power Quality triggers to be based on a 1 cycle updated RMS. Up to 170 events can be stored until the memory fills. The meter stores waveform data in a first-in/first-out circular buffer to insure data is always recording. Note: Sampling rate based on 60Hz systems. For 50Hz systems, multiply by 1.2. The unit uniquely offers a waveform scope to view the real time waveform for voltage and current. 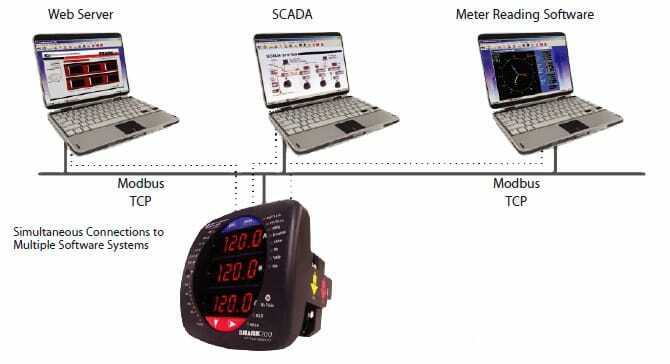 Waveform scope allows the meter to be used as a basic oscilloscope throughout a power system. The meter stores an independent CBEMA log for magnitude and duration of voltage events. This allows a user to quickly view total surges, total sags and duration without retrieving waveform data. stored waveforms, harmonic analysis is available to the 255th order. The Shark® 200 meter provides two independent communication ports with advanced features. RS485 - This port allows RS485 communication using Modbus or DNP 3.0 Protocols. Baud rates are from 9600 to 57.6k. KYZ Pulse - In addition to the RS485, the meter also includes Pulse Outputs mapped to absolute energy. Uniquely, the Shark® 200 meter also has an optical IrDA port, allowing you to program it with an IrDA-enabled laptop PC. Amperis Rapid Response™ Ethernet card allows for high speed Ethernet communication utilizing a 100BaseT protocol communicating with up to 12 connections with Modbus TCP. The card supports a static IP address and is treated like a node on the network. The Shark® 200 meter provides fast and reliable updates to HMI packages, SCADA and COM EXT download software. The Web Server allows access by almost all browsers over the Internet. RS485 Modbus or DNP 3.0 output and the expandable I/O. not need to be replaced. methods of collecting voltage information within a Utility power distribution grid. The Shark® 200 meter allows you to log substation data over time with regard to electrical usage, demand, voltage, current, PF and many other parameters. This enables a complete analysis of the power system over time. The Shark® 200 meter offers unequaled I/O expandability. Using the two universal option slots, the unit can easily be configured to accept new I/O cards even after installation. The unit auto-detects installed I/O option cards. Up to 2 cards of any type can be used per meter. 1. INP100S: 100BaseT Ethernet Capability The meter can provide 100BaseT Ethernet functionality. Using this card, a user can connect to 12 simultaneous Modbus TCP/IP connections. Amperis exclusive Fiber Optic Daisy Chain switchable built‑in logic mimics RS485 half duplex bus, allowing you to daisy chain meters for lower installation costs. Full duplex is also assignable.